As we usually do every year, we pack ourselves and head to Zimbabwe to visit our friends the Vincents. Roy, Rene and Alan. This year 5 of us went together to hunt. Gerhard, who we have adopted to be our "grandad', Walter, who does not need any introduction from all the damage he leaves in his wake. Anna-Marrie and Horst, who try to keep a smile on their faces despite Walter's presence, and of course your truly. Here are a few photos of our hunt, which we hope you enjoy looking at. 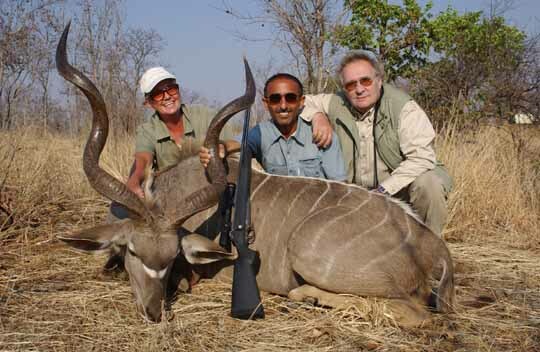 All the animals I have shot were with the rifle you see below, which is a 375/404 built on a Dakota 76 action. It has a Dan Lilja barrel, and McMillan stock, a Leupold 2.5-8 scope in Dakota mounts. 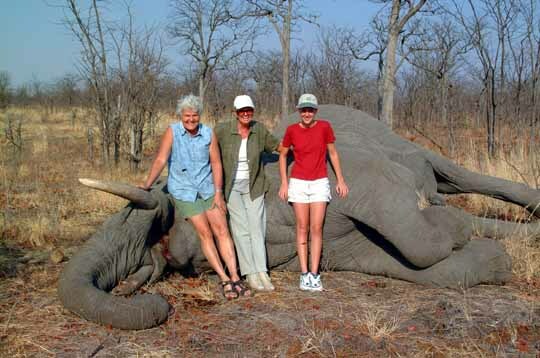 I used the Barnes X 300 grain bullet for all my hunting, except for elephant I used a solid. We shot this sable towards the end of our hunt. 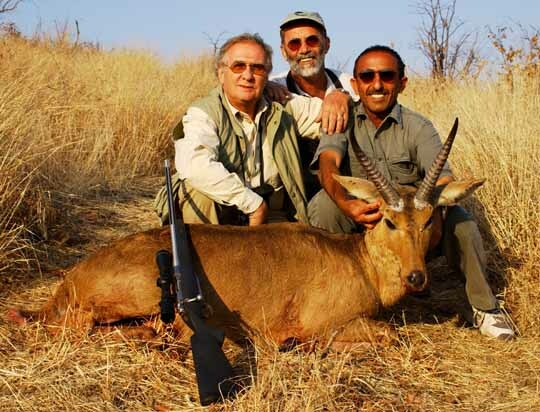 We have been seeing sable on a regular basis, but non were mature enough to shoot. 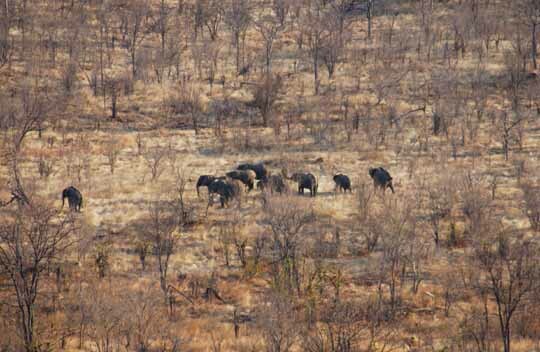 We were on our way back to camp late in the morning, when we saw a herd of sable feeding on top of a hill. We stopped to look at them, and noticed this fine looking bull. 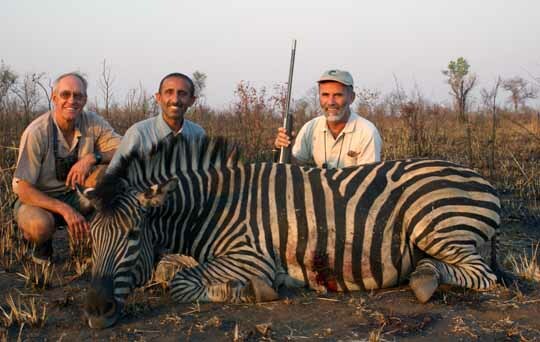 They were not very far from us, probably around 300 yards, but they were in high grass, and we did not want to take a chance at shooting him at that distance. We left the truck and proceeded to stalk them. It took us quite a while to get down wind, and climb the hill to be level with them. 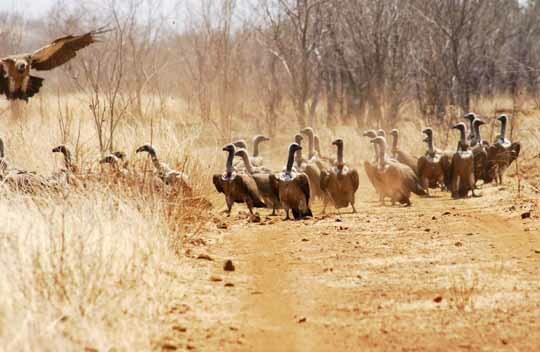 By that time, they have come down the hill into the valley, and were walking to a waterhole about a 1/2 a mile away. We waited until they disappeared from our view, and ran after them. Wd got to about 50 yards from the waterhole, which was in a dip, and obscured from our view, and could see some of the cows which have already had their drink walking up the hill. We waited for this bull to come out and follow them, which he soon did. There were some impalas between us and him, which got his attention. He stopped to look back towards us, facing to our right at an angle. I placed a Barnes X 300 grain bullet on the point of his shoulder, angling inwards. He ran a few yards and started to tumble down the hill. Anna-Marrie loves to cook and eat zebra, so she gave us an order for a zebra. She brings her own spices and bread crumbs, and makes a delicious dish which everyone loves - especially Walter! We saw a few zebra feeding late in the afternoon. Roy, Alan and myself got out of the truck and stalked them. We managed to get to about 100 yards, and one 300 grain bullet put this stallion down. He was hit on the other side, and as you can see the bullet went through. He ran a few yards and dropped. An impala and the photogenic trio! A common reedbuck, shot early in the morning. We saw him across the valley on the other side on a hill. I fired a shot at him and missed! He ran a few yards and stopped looking back at us, I fired another shot and hit him in the rear end, and from the way he ran off we thought I had broken his rear leg. We ran across and started looking for him. We got to the place where he was hit, and found the blood trail. Roy followed it, while I went up the hill to be able to get a clear shot if I see him running. We found him dead within a few yards, as the bullet raked across his body, and you can see where it came out, just behind his opposite shoulder. 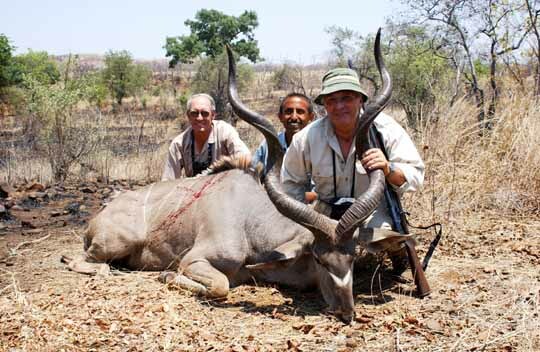 A successful morning's hunt for cape buffalo. We had 4 buffalo left on our quota, so when we saw these 4 bulls, we thought of trying to get them all. We did, and he last one shot tried a "search and destroy" sort of mission to get back at us. I shot him in the shoulders, and he took off to our left, suddenly he changed directing and came towards us. We were in the bush so he could not see us very clearly. He stopped 12 yards from us for a second look, and I put one more bullet into his head. Granddad shot a giraffe, which took us a while to cut up. 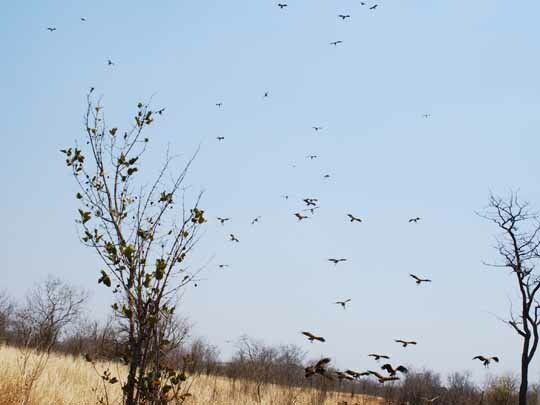 These vultures were flying overhead, waiting for us to leave to come and do their usual cleaning up job. You see them coming down with their landing gear extended. Safe and sound and all ready for work. Walter and his "self guided" warthog. We saw this warthog running up the side of the hill you see on the left. We all jumped out and tried to help Walter shoot it. The warthog disappeared from our view, and after a few yards, Walter decided he did not want to be chasing warthogs all over the place, so he told me to do it. Roy, Alan and myself went after the warthog, and as we were a couple of hundred yards away, we heard a shot coming from Walter's direction. We went back, and found Walter standing by this pig, with the biggest smile I have ever seen on his face! We fell victims to quite a bit of verbal abuse from him, and he told us in no uncertain terms that he did not need either me or Roy to go hunt again. And he had the proof right be his feet! We only put an end to his pride after we told him he had to carry his warthog and take it back to the camp, as he was not welcome in the hunting truck. A wonderful change came over him, and we were all friends again. 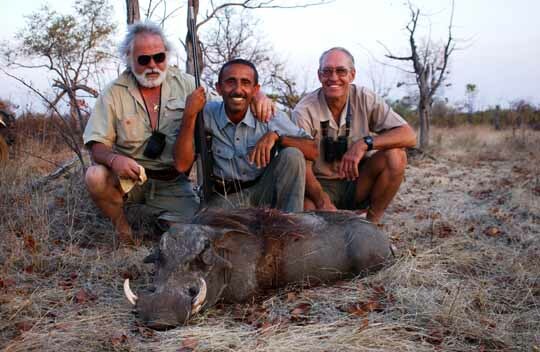 Well, our very shaky friendship did not last very long, as we saw this warthog a few miles after Walter shot his, and I jumped out of the truck and shot it. Walter started off again about not only did I need a PH to guide me to a warthog, but he also did not manage to find a pig as big as his. We then started discussion how to solve the problem of the "extra" weight we had to carry in the hunting truck - the discussion was between me and Roy. 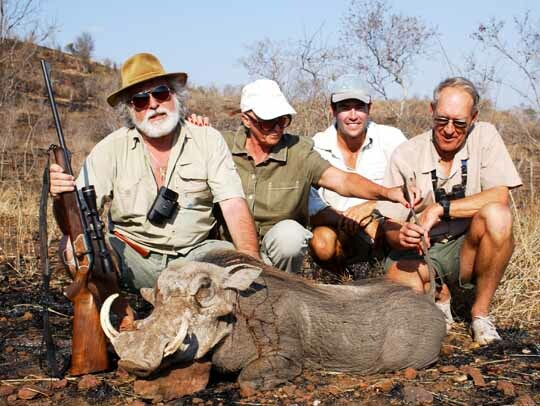 We then decided that warthogs tend to go rotten very quickly, and as Walter's was shot quite a while before, we might as well throw it away to the hyenas, as it won't be fit enough to eat by the time we get to camp. We solved the problem by making Walter promise to keep his mouth shut for the rest of the trip back to camp! A Waterbuck we shot early one morning. Granddad spent ages taking photos of it with his "real" camera, as opposed to our digital ones. We were driving along in the afternoon, and suddenly the boys in the back were tapping on top of the roof, while Alan was screaming for me to get my rifle, as they could see a lion! We stopped the truck, and looked through our glasses in the direction they were pointing. 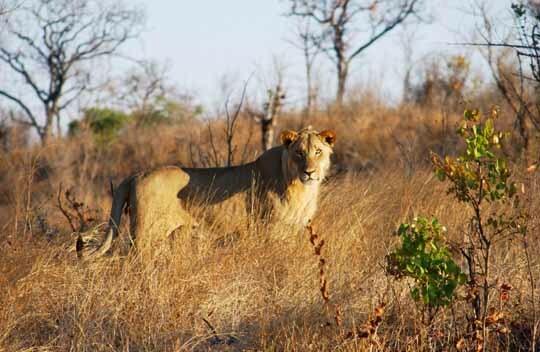 We saw this young lion, and a lioness behind him. He was far too young to shoot, so we got closer to take a few photos of him. We took this photo from about 20 yards. The lioness was hiding in the grass, and was hidden all the time except when she lifted her head to take a peak at us. 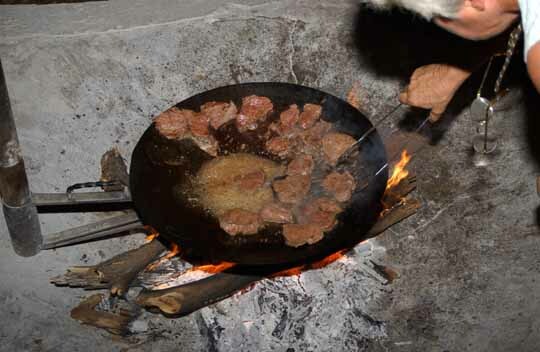 Rene busy cooking some buffalo tenderloins for dinner. One of my favorite meals! We took this picture of these elephant with a 450 mm zoom lens. They were about a mile away from us, as we were on top of mountain trying to locate elephants. A few days later we did the same thing, and saw some bulls coming out of the National Park. They were a few miles away, so we could not tell how big they were. We came down, and went looking for them. Eventually, we did find them, but all were young bulls. 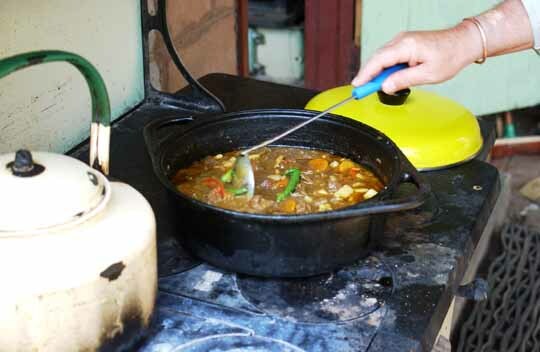 Granddad would not stop telling us about how good his curry was, so one day we told him to prove it for us. Here he is busy cooking it, and a great meal it turned out to be too. We throw all the bones away from the camp, and Roy built a blind there for the hyenas. 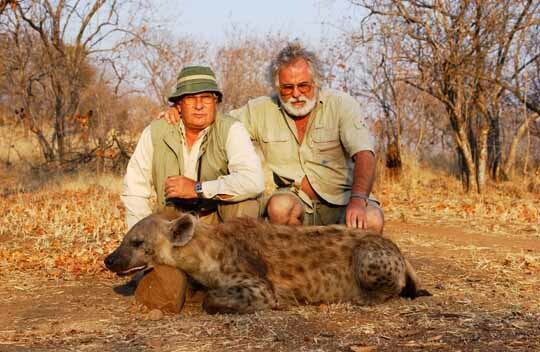 We went to look one morning, and found two hyenas feeding, and shot this one. We call this photo The Good, The Bad And The Ugly - although we are not sure which is which! Take your pick! 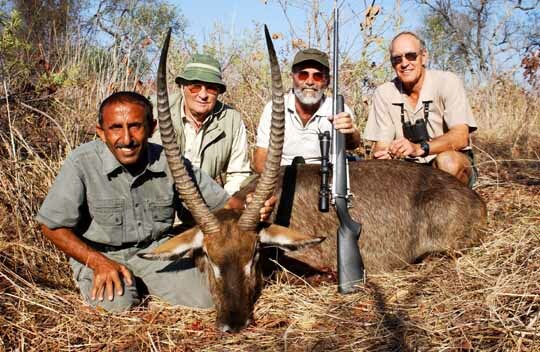 We had two kudu cows left on quota, so Walter decided to shoot one, and Granddad the other. WE saw some cows under the shade of a tree at midday, so Roy and Granddad went off to shoot one. As they were getting ready to shoot, we saw this bull run off towards the cows. Apparently he was between us and the cows, but he was hidden from our view. This is a perfect example of being in the wrong place at the wrong time, as they decided to shoot him instead of a cow. Granddad was very happy with his trophy. 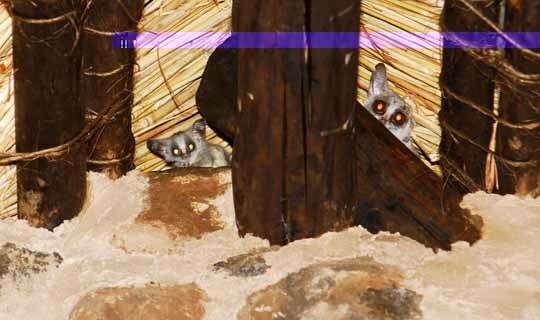 A pair of bush babies. The mother on the right, and her youngster on the left. They shared my hut with me. And one evening, just as I was about to doze off, I felt something drop next to me on the bed. I slowly reached for my torch, and found the little baby lying right next to me on the bed. He must have fallen off from the rafters. I took him next door to Anna-Marrie and Horst, we took some photos of him, and put him back. He did not seem to be scared of us at all. They are very curious animals. They would follow me around the hut, wondering what I am doing. 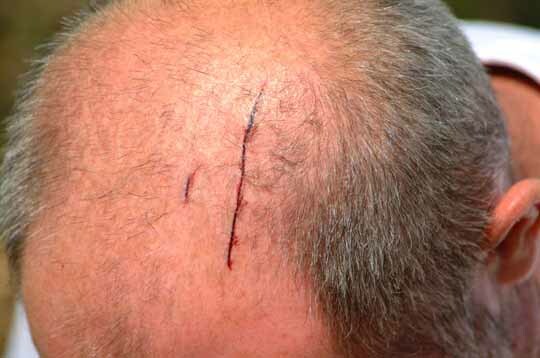 A victim of the "thorn beast" as Walter called the thorn tree. These trees are all over the camp, and Horst bent down to pick something, and as he came up he got whacked! Apparently he bled like a stuck pig! We were out of cam when this happened, and only found out about on our return. When we drove back into camp, we saw Walter sitting in front of his cottage, holding Granddad's 416 Rigby. 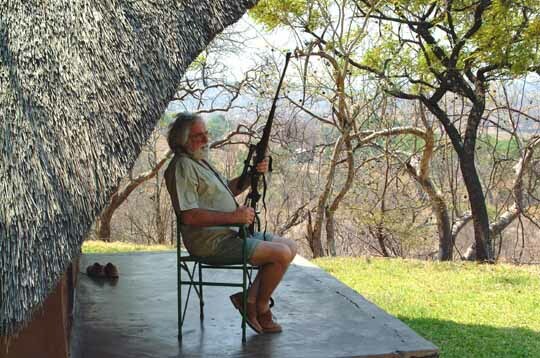 When we asked him what he was doing, he answered that he was protecting himself from the wild African flora! Rene, Anna-Marie and Storm, with our elephant. We found a number of elephants coming in from the park. So what we used to do is drive along the park boundary, and follow any suitable tracks we could find. One morning we saw some bulls cooling themselves under some trees in the park. We thought they might try to come into our concession in the afternoon to feed. We left them and went back to camp to have our lunch. later in the afternoon, we went back to look for these bulls. Sure enough, they have crossed into our concession, and we wasted no time in following their tracks. They were a few bulls together, and we picked this one as our trophy. We had to follow them for quite awhile, trying to get closer to this one. It was getting quite late in the afternoon, and we were worried we might not have enough time left before it got dark. Well, lady luck smiled on us, and we managed to get to about 50 odd yards from this bull, and one 300 grain solid into his brain brought him down. We left him there and went back in the morning to cut him up. That is when we took this photo. 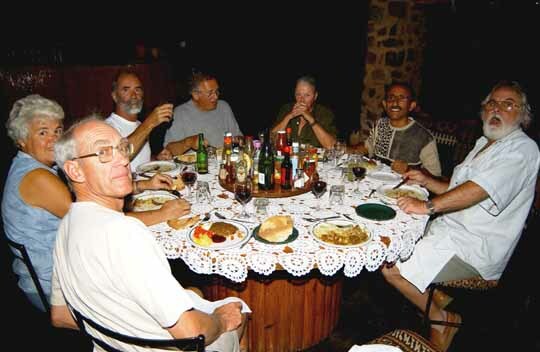 Our last dinner before leaving in the morning to Victoria Falls and catch our flight back home. A great time was had by everyone.